"The feedback I got on TheNextBigWriter played a huge role in sculpting my first novel, and set it on the road to publication. It is often difficult to view one’s own work with the necessary detachment to know when plot elements don’t work, or the pacing is off, or something is badly explained, or any of dozens of other things that can go south. Having an extra set of eyes—or in the case of Static Mayhem hundreds of sets of eyes—can make the difference between a story your mother will love and a story you can sell." "TheNextBigWriter has been such an important part of my journey to becoming a published author. In the years since I became a member, I have learned so much about writing and myself. Beyond the valuable feedback on my work, I have made some amazing friends who have pushed me further than I ever imagined possible." "I wanted to say thank you for all you do with this site. I found it back in 2009 and because of all the wonderful people here, I was able to workshop The Ghost Files on the original site under my old username maryapryl. The book was optioned for film by one of the guys who worked on Showtime’s hit series Dexter and they will be making the film later this year. I would not be where I am without this site and all the hardworking people on here. I recommend it every time someone asks me what do I need to do to be a better writer. So thank you !" "I honestly don't know where I'd be as an author without tNBW. This international community of writers provides support in all aspects of the craft, from drafting that first novel or short story, to publishing and marketing. Members have access to diverse perspectives and areas of expertise, as well as the opportunity to interact with writers of all genres. 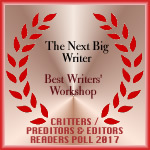 I have met some of my best critique partners on tNBW, and have grown immensely as a writer thanks to the honest feedback I've received through the site." This page was created in 1.3596 seconds.